We thought it would be fun to take a closer look at George Tinworth and his humorous comical mice. For a more detailed account on the life and work of George Tinworth visit George Tinworth – The Greatest Doulton Lambeth Designer. Here we look at some of the Tinworth mice and mice groups and their values. 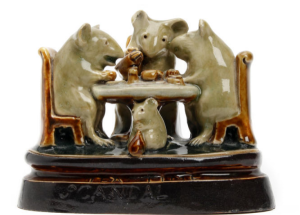 A rare George Tinworth Doulton Lambeth stoneware mouse group ‘Tea Time Scandal’ – modelled as three mice seated at a table drinking tea and gossiping, whilst a young mouse sits underneath the table, glazed in green and highlighted with ochre and treacle glazed detailing, the base inscribed ‘Tea Time Scandal’. Sold for £2,625 at Bonhams, London, 2012. Image Copyright Bonhams. A similar model also sold at Bonhams in April 2014 for £2,750. 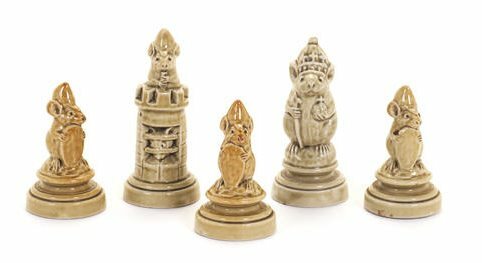 George Tinworth For Doulton Lambeth a Set of Five Mouse Chess Pieces, circa 1890 – comprising a King/Queen, a Rook and three Pawns in a pale green glaze 8.2cm, 8.8cm and 6.5cm high each with ‘G.T’ monogram, the King/Queen with Doulton Lambeth mark. Sold for £3,125 at Bonhams, London, October 2014. Image Copyright Bonhams. 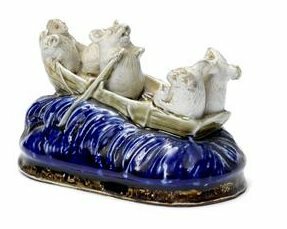 George Tinworth for Doulton Lambeth ‘The Cockneys at Brighton’ a Figural Mouse Group, circa 1880 – with mice modelled in a rowing boat at sea, titled to base 11cm high. Sold for £3,360 at Bonhams, London, Sep 2009. Image Copyright Bonhams. 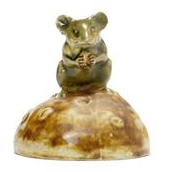 George Tinworth for Doulton Lambeth A stoneware model of a mouse on a bun, circa 1905 – 7.2cm high, impressed factory marks, incised artist monogram (SR). Sold for £1,920 at Bonhams, London, March 2009. Image Copyright Bonhams. 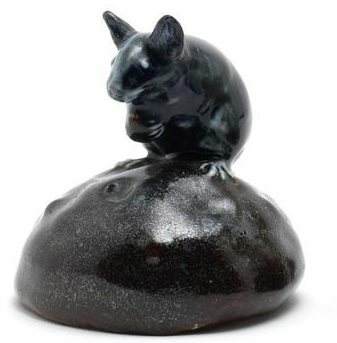 George Tinworth for Doulton Lambeth A Stoneware Model of a Mouse on a Bun, circa 1880 – the mouse glazed in a deep blue, the bun in a dark treacle glaze 7cm high, incised artist monogram ‘GT’ (restoration to ears). Sold for £937 at Bonhams, London, April2012. Image Copyright Bonhams. 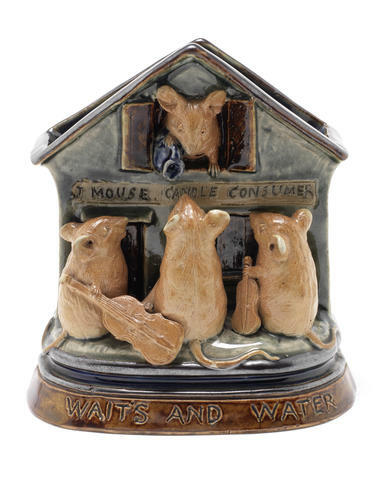 George Tinworth for Doulton Lambeth ‘Waits and Water’ a Good Mouse Group, circa 1885 – modelled with three musicians standing below an open window about to receive an unexpected reward for their playing, in salt glaze with green and blue, on titled base 13.5cm high, artist monogram. Sold for £4,000 at Bonhams, London, April 2013. Image Copyright Bonhams.